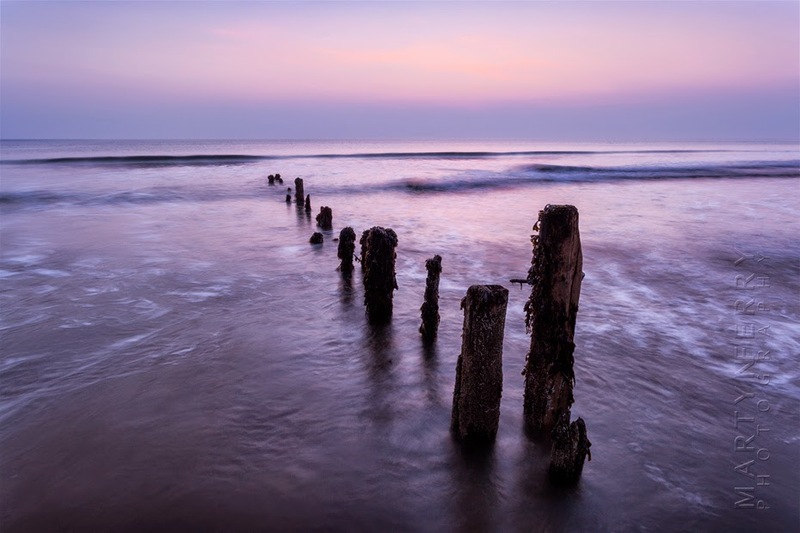 I drove over to Sandsend first thing, in preparation for sunrise and a bit of early morning groyne action. Setting up shop on the beach, I kept a wary eye on the dawn tide while it approached with some speed, as it is wont to do along this stretch of coast. There was a smudge of colour on the horizon and I took a few long exposure shots to smooth out the ocean, and make the most of what colour there was. Taken not long after I arrived, the pre-dawn light started up its morning display. The ocean had an almost glassy quality to it. The long exposure that laid me open to the ocean's insidious grasp. As the tide continued on its relentless journey along the beach I moved just ahead of it, from one set of groynes to another, managing for the most part to keep away from its saline clutches. But of course it couldn’t last, especially when the shot exposure times were in the minutes, and it wasn’t long before I had to stand there, waiting for the camera to finish its business, while foamy swells harassed my lower portions, each jousting surf seeming to mock me. But maybe I was imagining that. Or was I? scuttled up the beach with the shutter still open. With the sun now fully formed, the morning light started to warm up. After leaving the fast disappearing beach, I made my way into Whitby town and had a triumphant coffee and bacon sandwich to help lift my spirits, before returning to the apartment to dry off. By now the sun was starting to shine, so I walked across the road and descended the steep path to Whitby’s western beach and its collection of colourful beach huts. A freshly painted row of beach huts. beach hut business, it's quite a lot. According to one of the handymen who look after the huts, a good proportion of them need to be rebuilt after each winter as they get such a pounding from the waves, plus it seems to be a popular pastime for the local youths to give them a good kicking as part of a their evenings out. But they were looking quite resplendent in the morning sun, so I had a walk along the seafront and got a few snaps. After a little while the sun was beginning to warm up, but the atmosphere was getting very bright, hazy and bland, pretty much conducive to making any landscape shots look as boring as possible. I was at a loss of where to go next under such a wastrel of a sky. In the end I settled on Whitby Abbey, I wanted to visit it before my trip was over and now seemed as good a time as any. By the time I had got there the sky had started to improve a bit. 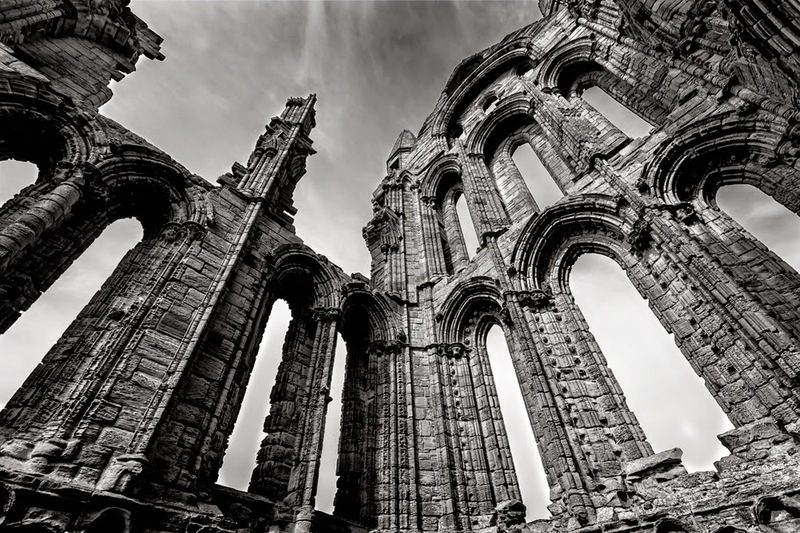 The first monastery on the site was founded in 657 AD in what was then known as Streoneshalh, the older name for Whitby, and housed a double monastery of Celtic monks and nuns, including the earliest English poet, the Northumbrian bard Cædmon. It has had a varied history over the years, including Viking attacks and restorations by soldier monks, until it was destroyed on the orders of Henry VIII in 1540 during the Dissolution. It suffered a final indignity at the hands of German battlecruisers in the First World War, where it sustained considerable damage in their effort to sabotage a signal post located on the tip of the headland. What has been left though is as atmospheric and impressive as monastic remains can be, and after getting a few shots from a distance with a sky that had started to improve in places, I moved in closer and took plenty of shots from amongst the fascinating interior of the ruins. The columns, arches and buttresses soaring above me were a splendid sight, and I got quite carried away. Plus it was good to be out of a blustery wind, which seemed to be an endless force on the exposed promontory. Following are a few shots of the interesting interior, or what passes for an interior on a building with no roof. After a couple of hours I was done, and I headed to a local supermarket to pick up some overdue lunch. I think nothing says being on holiday more, than scoffing down a prawn salad in a Sainsburys car park. So once I had finished my fiesta banquet I headed to Saltwick Bay, and, with a somewhat depressing inevitability, I had trouble finding the place, despite it being walking distance from the Abbey. In the end, and after a few wrong turns, and several stinging pangs of recognition in my own ineptitude, I found it. The tide was out pretty far so there was plenty of coast to explore, and once I had ascended the steep pathway to the beach, that is exactly what I did. I decided to walk across to the northern end of the bay to see what I could find while it was still accessible. 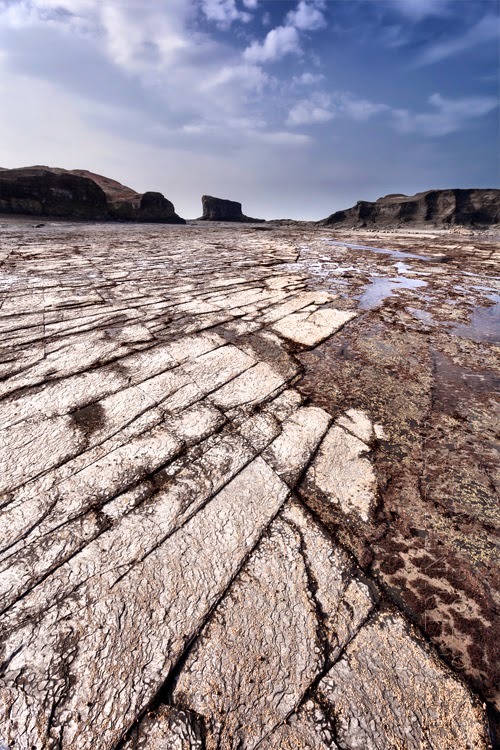 Saltwick is a mecca for fossil hunters as its cliffs spill rocks from all ages down onto the coastline, and in many colours as well, so walking across the boulder strewn section of the bay was like stepping over a rainbow of rock. In my enthusiasm to get to my destination, I forgot about hard lessons learned from previous rock hopping escapades and took another tumble. A rainbow of colours in the rocks that litter part of the bay. Looking towards one of the large limestone edifices. A view over the shale shelf to the Northern end of the bay. It was the last rock as well, I was so close, yet so miserably far from competency. I managed to perform this in front of a father and son, and I had flashes of Kimmeridge Bay flicker before my eyes, but at least this time I got an enquiry to whether I was OK or not. Understandably so, as it was rather a lavish fall. The boulder tipped as I stepped on it and my right leg sailed high into the air as I simultaneously landed flat on my back upon the solid rock below. Luckily I'm an old pro at this now and there was no harm done. Just to my pride. Again. 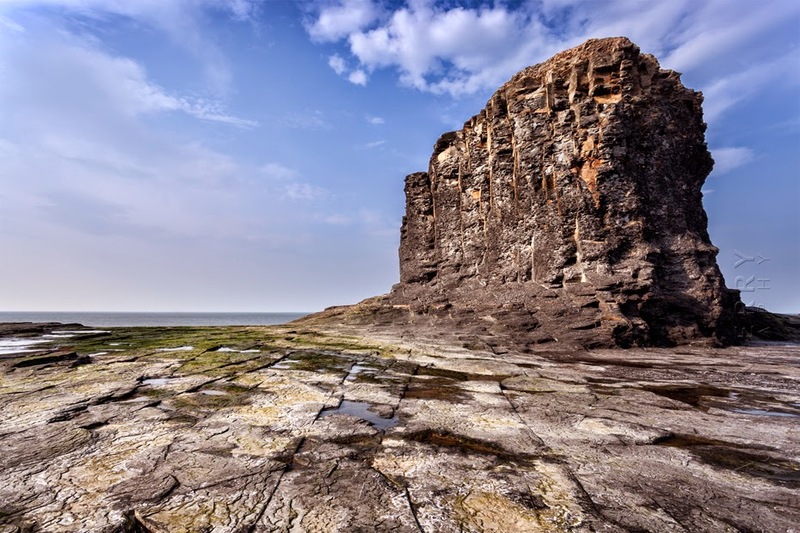 Once I had reached the far edge of the bay I had a scout around among the large limestone stacks, which were ceaselessly shedding chips of rock down their impressive flanks. I had the place to myself, everyone else was concentrated on the now distant sandy part of the bay. It could almost have been described as desolate, with large expanses of bare, taupe rock, dotted with huge boulders, and only the crashing of the waves and the jangling echoes of falling limestone shards as a soundtrack. Completely covered when the tide is in, it has a very empty feel to it at low tide. A towering limestone stack, which was continuously shedding chunks of rock. Once I’d explored the area, I took a stroll back as the tide was coming in at a pace, and I’d heard too many stories of people being marooned by the huge surges to take any chances. By now the sun was starting to dip behind the cliffs above and a keen wind was starting to bite, so I hiked back up to the car. With the tide creeping over the rocks it wouldn't take long for the whole bay to be submerged again. With the light starting to fade, I drove back to the Abbey car park and walked through to St. Mary’s church for a view over the town and bay for sunset, or what there was of it. A fog of cloud had engulfed the lower part of the sky and the sun was falling swiftly into the haze. It wasn’t long before the gloom had immersed it completely, and it had disappeared from view. So I packed up and stopped off in Whitby to get some of their famous fish and chips, before returning to the apartment to stuff my face. The sky never really came alive with colour, this was about as good as it got.